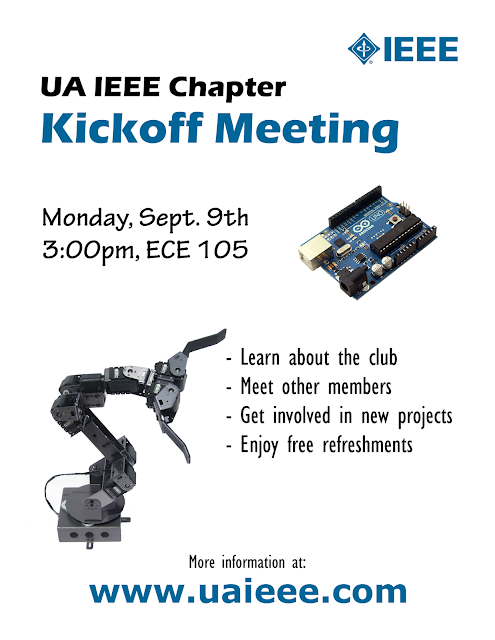 U of Az IEEE Student Branch: Kickoff Meeting on Monday! On Monday, September 9th, we're going to be holding our first meeting of the semester! You'll get a chance to meet this year's new members, and maybe even get involved in some new projects. Plus, there will be free food! The meeting will be on Monday at 3:00pm in the IEEE room, which is room 105 of the Electrical and Computer Engineering building.